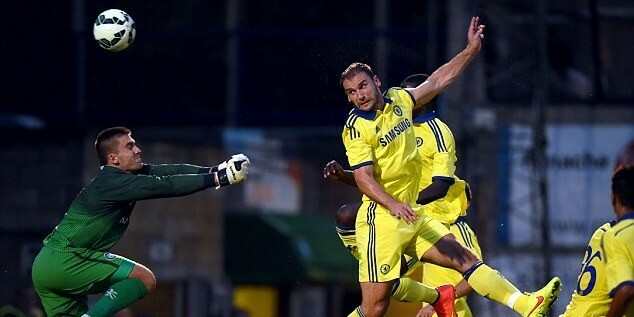 Chelsea demolished League Two side Wycombe Wanderers 5-0 at Adams Park on Wednesday, with John Terry and Branislav Ivanovic both on the scoresheet, as Jose Mourinho’s side got off to a flying start in their pre-season fixtures. Captain Terry slotted home goal number three from a Jeremie Boga corner in the second half, with last season’s breakthrough loan star Patrick Bamford putting the Blues 1-0 up in the first half with a cute finish and the 17-year-old Izzy brown scoring the first of his brace just after the restart. Chelsea’s World Cup stars were not involved in proceedings, with the likes of Eden Hazard, Cesc Fabregas and Diego Costa all still enjoying some time off after the tournament in Brazil. There were a fair few first-teamers dotted among what was a youthful Chelsea setup last night, with Mohammed Salah, Mark Schwarzer and Nemanja Matic joining both Terry and Ivanovic for the Blues in the second half. Kurt Zouma made his first appearance since his £12m January move, and Marco van Ginkel got a first half runout after having successfully recovered from his anterior cruciate ligament injury that kept him out of the whole of last season. It was the Serbian Ivanovic that made it 4-0, glancing the impressive Boga’s free-kick into the Wycombe net, and Brown rounded off the scoring with the goal of the night, curling a long-ranger into the top corner after strong running from Salah on the right. First-half line-up (4-2-3-1): Mark Schwarzer (c); Todd Kane (Kurt Zouma 20), Nathaniel Chalobah, Andreas Christensen, Nathan Ake; Oriol Romeu, Marco van Ginkel; Lucas Piazon, Lewis Baker, John Swift; Patrick Bamford. Second-half line-up (4-2-3-1): Mark Schwarzer (Mitchell Beeney 73); Branislav Ivanovic, Kurt Zouma, John Terry (c), Jay Dasilva; Oriol Romeu (Jordan Houghton 73), Nemanja Matic; Mohamed Salah, Jeremie Boga, Izzy Brown; Dominic Solanke. Chelsea boss wants £30m Manchester City target, but does he need him?